Should CW start worrying about THE FLASH? CW: The network is all-in on comic book shows, and its flagship THE FLASH dropped 0.1 to tie its series low 0.7. BLACK LIGHTNING held up fairly well in its 2nd outing, down 0.2 to 0.6. 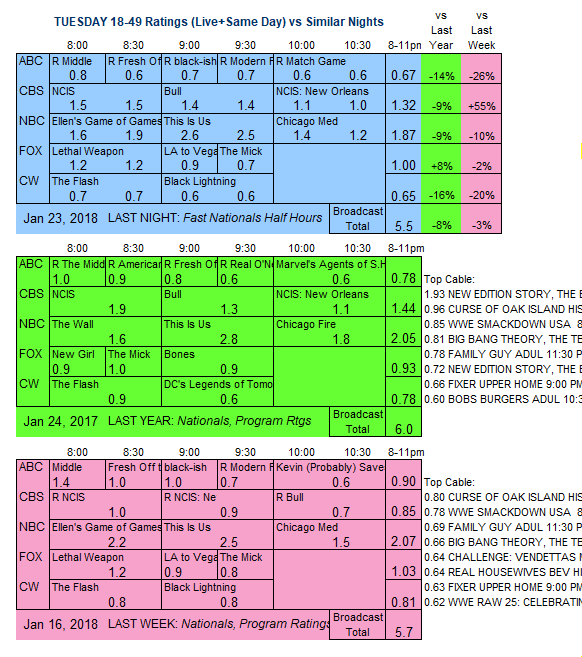 CBS: After a week of reruns, NCIS returned at a steady 1.5, BULL rose 0.2 to 1.4, and NCIS: NEW ORLEANS held at 1.0. 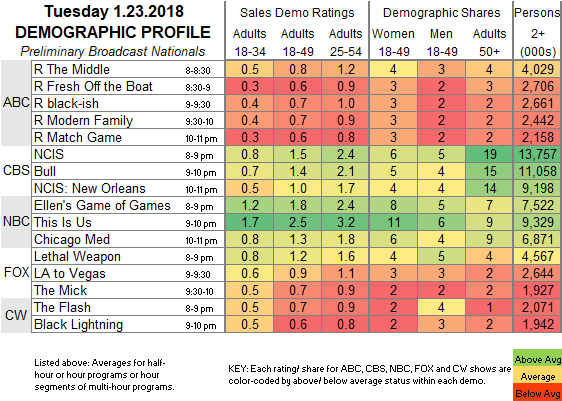 NBC: ELLEN’S GAME OF GAMES dropped 0.4 to 1.8, while THIS IS US remained at 2.5, and CHICAGO MED was down 0.2 to 1.3. FOX: LETHAL WEAPON stayed at 1.2, LA TO VEGAS was steady at 0.9, and THE MICK slipped 0.1 to 0.7. Tonight’s premieres include the newly-branded Paramount Network’s first scripted show, the miniseries WACO, as well as WGN’s BELLEVUE.